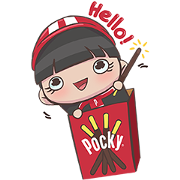 Share happiness with Pocky! Meet the adorable Pocky Cheer Squad, here to cheer up your chats. Spread the cheer with this fun original sticker set. Friend Glico’s official account to get them for free.